Fully Approved Irish Horse Board . Englishman attained the highest grade with the Anglo European Studbook , he was one of the few Elite stallions in the country . Englishman was Grade A by the time he was eight years old . Englishman was Champion Stallion at grading beating over 90 stallions . 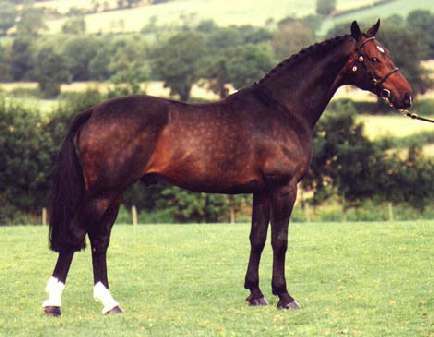 By 1998 Englishman ranked 7th overall in Irelands top ten stallions , he ranked 2nd in the top ten sires of foals and was in 3rd place in the top ten Irish Sport Horse Stallions , no mean feat as Englishman was the first British bred stallion to gain full Approval with the Irish Horse Board . 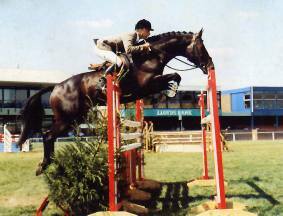 Englishman was the winner of the 1999 British Horse Foundation High Riser Award . His progeny have ben sold to the USA , Sweden and Holland for sums in excess of £30.000 . 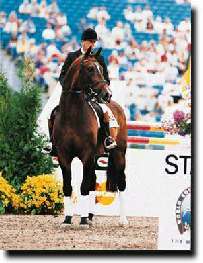 Englishman sired 2 horses which represented Ireland during the 2001 World Championships for Young Show Jumpers. Prolific sire of Champion stock in hand and under saddle including showjumpers , eventers , dressage horses , show horses and graded stallions . International Showjumper and Nations Cup horse .Half brother to Renkum Englishman he was leased to the Irish Army , ridden by Capt David O’Brien and represented Ireland in 5 Nations Cups .before being retired to stud in 2009 .